Viennese architect Otto Wagner (1841-1918) was part of the "Viennese Secession" movement at the end of the 19th century, which was marked by a revolutionary spirit of enlightenment. 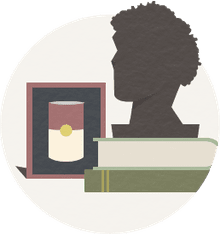 The Secessionists revolted against the Neclassical styles of the day, and, instead, adopted the anti-machine philosophies of William Morris and the Arts and Crafts movement. Wagner's architecture was a cross between traditional styles and Art Nouveau, or Jugendstil, as it was called in Austria. He is one of the architects credited with bringing modernity to Vienna, and his architecture remains iconic in Vienna, Austria. 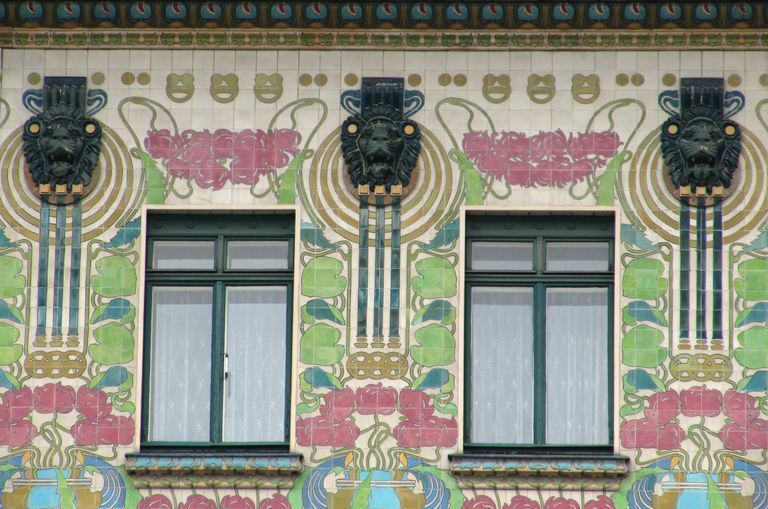 Otto Wagner's ornate Majolika Haus is named after the weather-proof, ceramic tiles painted in floral designs on its façade, as in majolica pottery. Despite its flat, rectilinear shape, the building is considered Art Nouveau. Wagner used new, modern materials and rich color, yet retained the traditional use of ornamentation. The eponymous majolica, decorative iron balconies, and flexible, S-shaped linear embellishment accentuate the building's structure. Today Majolika Haus has retail on the ground floor and apartments above. The building is also known as Majolica House, Majolikahaus, and Linke Wienzeile 40. Between 1894 and 1901, architect Otto Wagner was commissioned to design Vienna's Stadtbahn, a new rail system that connected urban and suburban areas of this growing European city. With iron, stone, and brick, Wagner built 36 stations and 15 bridges — many decorated in the Art Nouveau styling of the day. Like architects of the Chicago School, Wagner designed Karlsplatz with a steel frame. He chose an elegant marble slab for the façade and Jugendstil (Art Nouveau) ornamentation. Public outcry saved this pavilion as underground rails were implemented. The building was dismantled, preserved, and reassembled onto a new, higher foundation above the new subways. Today, as part of the Wien Museum, the Otto Wagner Pavillon Karlsplatz is one of the most photographed structures in Vienna. The "modernism" of the architecture is Wagner's use of traditional stone materials (marble) held in place by new building materials — aluminum covered iron bolts, which become the façade's industrial ornamentation. Cast-iron architecture of the mid-19th century was a "skin" molded to imitate historic designs; Wagner covered his brick, concrete, and steel building with a new veneer for the modern age. The interior Banking Hall is as light and modern as what Frank Lloyd Wright was doing inside Chicago's Rookery Building in 1905. Ever hear of Scheckverkehr? You do it all the time, but at the turn of the 20th century "cashless transfer" by check was a new concept in banking. The bank to be built in Vienna would be modern — customers could "move money" from one account to another without actually moving cash — paper transactions that were more than IOUs. Could new functions be met with new architecture? Otto Wagner was one of 37 participants in the competition to build an "Imperial and Royal Postal Savings Bank." He won the commission by changing the design rules. According to the Museum Postsparkasse, Wagner's design submission, "contrary to the specifications," combined the interior spaces that had similar functions, which sounds remarkably like what Louis Sullivan was advocating for skyscraper design — form follows function. For Wagner, this patient population deserved a functionally designed space of beauty as much as the man doing business at the Postal Savings Bank. Like his other structures, Wagner's brick church is clad with marble plates held in place with copper bolts and topped with a dome of copper and gold. Otto Wagner was married twice and built a home for each of his wives. The first Villa Wagner was for Josefine Domhart, whom he married in 1863, early in his career and at his controlling mother's encouragement. Villa I is Palladian in design, with four Ionic columns announcing the Neo-Classic home. Wrought iron railings and splashes of color express the changing face of the architecture of the time. When his mother died in 1880, Wagner divorced and married the love of his life, Louise Stiffel. The second Villa Wagner was built next door. Two of the most famous residences in Vienna, Austria were designed and occupied by that city's iconic architect, Otto Wagner. Wagner built Villa II for his second family with his second wife, Louise Stiffel. He thought he would outlive the much younger Louise, who had been governess to the children of his first marriage, but she died in 1915 — three years before Otto Wagner died at the age of 76.